Sydney Shop Girl: 'Flesh Wounds', 'Natural Born Keller' and Yes, A Saint Is Born. The Weeknight Book Club. 'Flesh Wounds', 'Natural Born Keller' and Yes, A Saint Is Born. The Weeknight Book Club. I know forty is either just a number or the new thirty. I also know that life begins at forty. But one thing I never really thought about before turning forty was how my age would influence my reaction to reading the memoirs of notable figures in our culture and society. All of a sudden you realize just how precious time is. It really is a commodity and not just something that stretches ahead of you with unlimited possibilities, as far as the eye can see. Reading about another's loss of a loved one, the cruelty of aging on their parents and also how the passing of time eases the pain of some traumas resonates with what you are already beginning to experience in your own world. Sharing their experiences of both being a parent and being parented themselves gently prods something within yourself. How are you parenting and why do you parent the way you do? You being to understand your own parents and also be more forgiving and understanding of them. You begin to realize that parenting is like anything else that's worthwhile - it's not easy and it doesn't always, if ever, go to plan. That there's more to parenting than saying what you'd do and how you'd do it. The real test is how committed you remain to those ideals when it comes to testing them on a little person with their own will and ideas and that you also love more than you ever thought it was possible to love. And in a real world with its competing demands, expectations and occasional life changing curve balls. But somehow, you just keep on doing what has to be done with energy and (eventually) patience you never thought you had. And then you look back on things and laugh at how easy they were in relation to the new challenges that you are now dealing with. I've got two memoirs to share with you today. Both of which I couldn't put down. I enjoyed them for different reasons. While they are both a little thought provoking, they're also 'light' enough to be enjoyed at leisure over the festive season break. Richard Glover is a much loved and respected figure in the Australian media. He is a columnist with the Sydney Morning Herald as well as a drive time announcer for ABC's Sydney station. You may also know him as Mr Debra Oswald, the creator of Offspring and author of Useful. (which I've reviewed previously but blogger won't let me search for the review). In his column, Glover refers to his wife as Jocasta and while he often quotes what she says in real life, the 'real Jocasta' is nowhere near as harsh as her character in Glover's writing. 'Flesh Wounds' is a beautifully written and sometimes darkly humorous recollection and interpretation of Glover's childhood at the hands of his two charismatic but dysfunctional parents. Early in the book, Glover confesses to having a perverse pleasure in bringing up the topic 'who has the weirdest parents' at social gatherings. Mostly because he knows he'll win hands down but also because it tends to ease the tension and helps gets everyone laughing and talking with each other. With a mother who ran off with his English teacher to create a kind of Hobbit-esque nirvana and an alcoholic father who married almost as many wives as he had discarded yachts, it's a testament to Glover's intelligence, resilience and the family he has created that he is the man he has become. One of the issues Glover explores in 'Flesh Wounds' is his mother's single minded obsession in passing herself off as a member of a social set much more privileged and moneyed than that to which she was born in England. 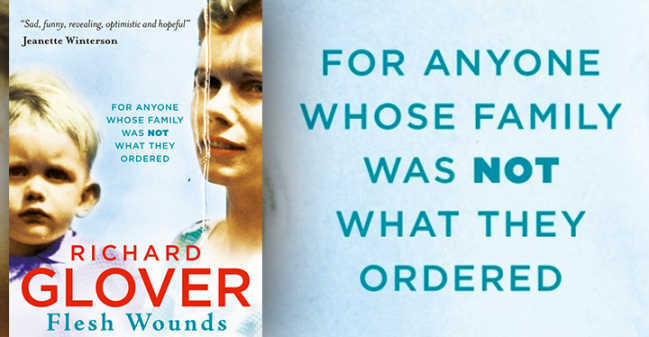 Glover never had it in his heart to confront his mother with the truth of her past when he first discovered it and as she descended into a world of dementia in a nursing home after the sudden death of her second husband (Glover's English teacher), it seemed merciless for him to do so. There are several points in the novel at which Bunty reveals herself to be both completely self obsessed and possibly functioning with an undiagnosed and untreated mental illness. She was inordinately proud that the 'natives' who worked for her when the family lived in Papua New Guinea looked after the infant Richard's every need. She went so far as to tell her son this as well as the fact that he was probably the first child in Australia to be conceived via artificial insemination. While neither of his parents were physically abusive or neglectful, they did make some glaringly bad parenting decisions. Even in an era where children were meant to bend to the lives of their parents. After the divorce, Richard's father decided to go off on a trip to the UK and was almost going to leave his young son to fend for himself until a friend could come over and assume responsibility for the household. Richard's mother encouraged her son to go to London to live with a producer friend of hers in the hope that the producer could further her son's career. The producer turned out to be a sexual predator and though his mother did fly to London to rescue Richard, she was at pains to highlight to her former husband just how much out of pocket she was because she had to make the trip. 'Flesh Wounds' is an often hilarious and inspiring read about how Glover overcame the life he had with his parents and created a life and family far removed from that chaos and neglect. It's also a loving tribute to the wonderful people who stepped into Glover's life at various times to give him the love and support that his parents seemed to be incapable of. Sometimes, the best parents in one's life aren't the ones they were born with. 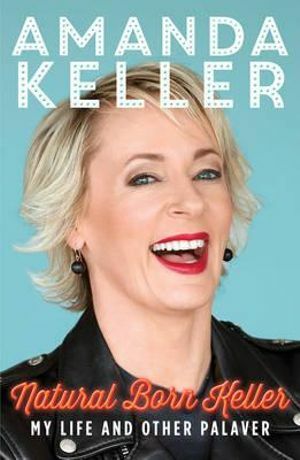 Amanda Keller's memoir, 'Natural Born Keller' doesn't recount a childhood anywhere as dysfunctional as Richard Glover's. I'm a huge fan of Keller's work on the radio at WSFM101.7. Her raucous sense of humour and on mike chemistry with her co host Jonesy always puts a smile on my face in the morning peak hour. Both Amanda and Jonesy are parents and their stories of life at home with their spouses and kids are a welcome contrast to the dialogue on some of the other FM stations. But back to 'Natural Born Keller'. I was surprised at how gentle Keller's voice was in her writing. But then again, Keller was blessed with both a very supportive family who loved each other to bits (Amanda's sharing of her mother's death and the grief afterwards had me in tears) and a full and challenging career. Have you read any interesting memoirs recently? If you have read either 'Flesh Wounds' or 'Natural Born Keller', what are your thoughts? I love reading memoirs. My favourite thing. I haven't read these ones (yet). Hope you have some good reads lined up for the trip, Leanne. It is not a memoir as such but based on a real person Circling the Sun by Paula McLain is an interesting read. Thanks Clarissa! I am going to track this down and see what it's all about.